Is gambling the same as risk-taking? Have you heard of BBC Radio 4’s The Moral Maze? In case you’ve never heard it before, like me, it is a show which debates the morality of various issues. This particular episode was on gambling. It's worth a listen here. The show actually skirted around the issue of whether gambling is a moral thing to do in-and-of-itself. The consensus on the panel was that gambling was an entertainment activity and that it should be legal and regulated. You might take issue with this, but, generally, so far, so uncontentious for today's society. 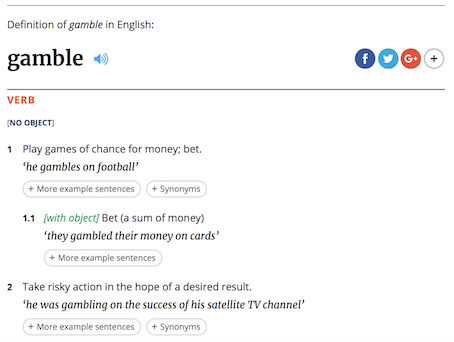 Firstly, on a practical level, the dictionary definition of gambling can be a literal or a figurative term, as you can see from the Oxford English Dictionary definition above. Used literally, to gamble means placing something of value at risk in a game in which, although skill may be a factor, is determined by chance and the outcome is uncertain. Used figuratively, it is used to say someone is taking a big risk. These are two different things and perhaps our English words don't help much. The comparison to buying a three piece suite is that what you spend your money on is your business. Some people might buy a new three piece suite for £2,000 whilst others might spend £2,000 gambling and that is their entertainment. I find this argument really crazy: if you blow the money on gambling, you have lost the money; if you spend it on a three piece suite you’ve got something you can use for 20 years, or something you can sell on for someone else to use and for you to recoup your money. Plus, no-one ever got addicted to three-piece suites. Someone else once said to me that gambling addiction is the same as their wife's handbag addiction - it is someone's private business about how they spend their money. Put aside the fact that this man is in the casino business (and I quite like him as a person), and it is not difficult to see the fallacy. His wife's handbag collection - whilst it might take up space - is not affecting anyone else. She gets use out of the bags, and the bags have a value. Spending money on bags also creates wealth for others - from the farmer with the cow, to the tanner, to the factory which makes the bag, to the retailer who sells it. The whole chain creates value. What might have been a £10 hide becomes a £1,000 bag. Spending money on gambling creates no new value. The £10 stake goes either into £10 of someone else's win, or £10 into the pocket of the industry. Wealth is just shuffled around. The second comparison was with being an entrepreneur. So being a gambler is supposed to be like being an entrepreneur. Setting up a company involves solving some kind of problem or gap to make the world a better place for others, whilst seeking profit for yourself. I'd say gambling is thinking only about generating profit for yourself with no thought of benefit to anyone else. One panellist on the show, Mark Littlewood, said that "Buying a house is the biggest gamble most people will make in their life". Of course, he is confusing gambling (figurative) with gambling (literal). In the long term the home or more precisely its land will always have value whether house prices rise or fall and even if there is a short term loss for 10, 20 or even 30 years. In the long term it provides generational wealth, whereas gambling takes away generational wealth. Gambling is patently not the same as risk-taking. It is not the same as buying a three piece suite, setting up a business, or buying a house. Gambling is a distortion of risk-taking in which over time the house wins and the gambler loses. All gambling is taking a risk, but not all risk-taking is gambling.